Why He’s a Babe: Our friend Phil is on the cover of this month’s KoreAm Journal lookin’ hella hawt. His scruffy good looks aside, however, it’s what Phil reveals in the the accompanying Q & A–conducted by our other pal, Jeff Yang, in what is probably Phil’s most candid interview to date–that explains why everyone crushes on Angry Asian Man. Dude’s a total rock star–we’ve spoken at packed conferences where people line up just to get a whiff of his Angry Asian Man Essence–yet he couldn’t be more humble, self-effacing, and dedicated to his readers, his community, and the things he writes about. The 35-year-old mayor of California city San Gabriel was arrested in the wee hours of this morning after an incident in which he allegedly scuffled with a 33-year-old woman (relationship unknown), grabbed her purse of belongings, and attempted to drive off with her still clinging to his S.U.V. Police said they received a call about 1:15 a.m. Friday about a heated argument between Huang and a woman. Investigators determined Huang was arguing over money with the woman outside a restaurant in the 300 block of West Valley Boulevard. Huang allegedly took the woman’s purse, which contained her car keys, cash and personal belongings and got into her car, Duran said. The woman attempted to prevent him from leaving by reaching through the vehicle’s window. Huang then allegedly pushed the woman, got out of her car and entered his own, a Nissan SUV. The woman then reached through the passenger window of Huang’s SUV and stood on its running boards, Duran said. Huang accelerated as fast as 45 mph down Prospect Avenue with the woman hanging on, Duran said. 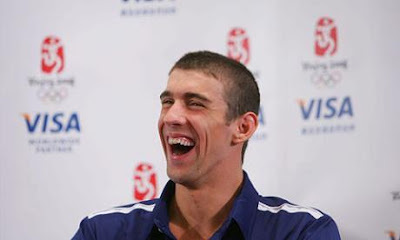 “It’s a 25 mph speed limit zone, and he’s doing 45 with the female hanging on the car,” Duran said. Huang drove more than a quarter mile with the woman on his car, Duran said. The woman was apparently unhurt by the incident. But mouths are still agape–each detail of the story more jaw-dropping than the previous. Filed under: Albert Y.M. Huang, California, Californiasians, Elected Officials, Mayor of San Gabriel, Mayor Snatches Purse And Drives Off, Mayors, S.U.V.s, San Gabriel, Scuffles, Woman Clinging to S.U.V. Known for: Staying busy. Shinoda is beloved by some for his decade of rockstardom with rock-hop (hip-rock?) band Linkin Park and side project Fort Minor. Others hail him for his music producing achievements, which include tracks and albums with the likes of Busta Rhymes and X-Ecutioners, and a slate of remixes from Depeche Mode to Metric. Known for: In the culinary world, Masumoto peaches are synonymous with the best. The heirloom variety Masumoto Elberta peach, in particular, is prized by chefs, but it’s so delicate, it can’t travel to market. Devotees of the Masumoto Elberta must, instead, adopt a tree for a year and harvest it themselves, usually in late July to early August. But the history behind these peaches–and the nectarines and grapes the Masumoto Family Farm produces just south of Fresno–is as extraordinary as the fruit itself. The Masumotos first arrived in California in 1898 and have been farming the Central Valley for over a hundred years. 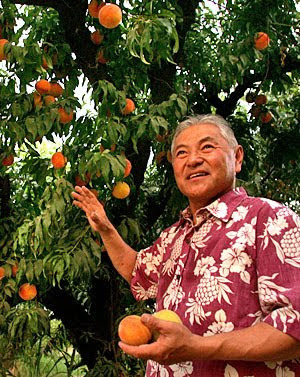 Patriarch David “Mas” Masumoto is not only a 3rd-generation farmer but the author of eight books that weave together stories of food, farming, family, and Japanese-Americans (the Masumotos were interned during WWII). Masumoto’s latest, Wisdom of the Last Farmer: Harvesting Legacies from the Land, debuts this month. Do you dare eat a peach? If it’s a Masumoto, the answer’s yes. Tom Colicchio’s Craft restaurant in Los Angeles is currently offering an all-Masumoto Elberta tasting menu–it’ll set you back $100–through early September. 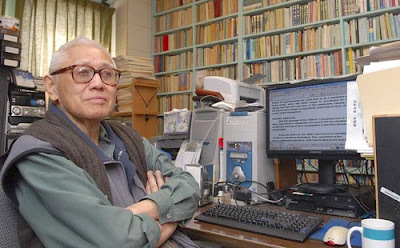 Historian Him Mark Lai passed away at the end of May at the age of 83. Educated as an engineer, Lai taught the first course in Chinese-American history in 1969 and was known as “the dean of Chinese-American studies.” Bi-literate in English and Chinese, he wrote over 100 essays and 10 books, including A History of the Chinese in California, a Syllabus and the sometimes heartbreaking Island: Poetry and History of Chinese Immigrants on Angel Island, 1910-1940, a translation of poetry written by Chinese immigrants found scratched on the walls of the detention barracks there. Being Asian-American is a funny thing. A lot of people talk about its “in-between-ness.” Then there are those who don’t seem to get that where we’re really “from from” is right here in America. Lai’s work, which included saving documents, newspapers, and letters from trash heaps and dumpsters and archiving them, was devoted to showing just that–how we got here, stayed here, and made “here” our home. To order some of Him Mark Lai’s works, click here. To read Lai’s LA Times obituary, click here. Known for: Trojans football, yo. Winning the 2008 Chuck Bednarik award for being the best college defensive player in the country (middle linebacker, to be exact), as well as being named an All-American. 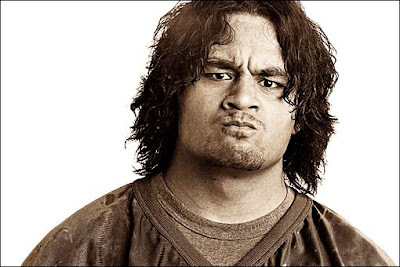 Often getting compared to our boyfriend and fellow USC alum and Samoan, Troy Polamalu. Emerging as one of the top prospects in the upcoming NFL draft during Senior Bowl workouts last week because of his speed and “agility in space,” scout-speak for phenomenal quarterback-face stuffing capabilities. Rumor has it that Rey might go to the Detroit Lions, who finished 0-16 in 2008–a dubious first–and have the first draft pick. In which case, Rey will have his work cut out for him, and no time to embarrass himself by bumping and grinding with sideline reporters…not exactly a “win-win,” but a good thing all and all.